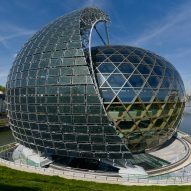 Pritzker Prize-winning architect Shigeru Ban has completed a music complex near Paris, featuring an egg-shaped auditorium and a wall of solar panels that move to follow the path of the sun. 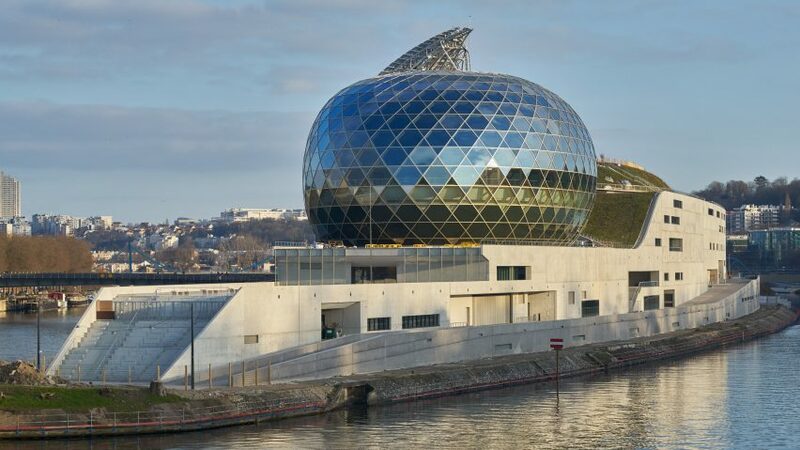 The Japanese architect's Paris-based office won an international competition held in 2013 to design La Seine Musicale – a musical facility comprising a large multipurpose venue and a smaller auditorium. Shigeru Ban Architects collaborated with local architect Jean de Gastines on the the complex, which is located on the Ile Seguin between the Boulogne-Billancourt and Sèvres neighbourhoods in the French capital's western suburbs. The heart of the building is the Grand Seine multi-purpose hall, a 6,000-seat venue for events including concerts, musicals and ballets. There is also a smaller performance space for 1,150 people, which is home to the Insula Orchestra, and intended as a venue for classical concerts not requiring amplification. This smaller auditorium is housed within a wooden grid-shell typical of Ban's experiments with timber-framed buildings – which include an office building in Zurich featuring an exposed timber structure, and an art museum in Aspen with a complex wooden roof structure. The ovoid structure's latticed laminated-timber frame is sheathed in glazing and sheltered from direct sunlight by a sail-like surface covered with photovoltaic cells. The triangular sail is mounted on rails that allow it to follow the path of the sun, therefore increasing its efficiency and ensuring the lobby behind is shaded throughout the day. "The form of the solar panel is inspired by a sail, so we can compare La Seine Musicale to a sailing ship," said the firm in a statement. "This environmentally friendly 'ship' will ultimately make a new symbol for the west gate of Paris." The interior of the auditorium is designed to create a warm and intimate atmosphere, with seating encircling a central stage area. Acoustic panels made from wood and paper tubes are suspended from the ceiling to enhance the concert experience. For most of the 20th century, the La Seine Musicale site was occupied by a manufacturing plant operated by car brand Renault. When Renault ceased activity at the facility in 1992, the buildings were left unused, before eventually being demolished in 2005. In 2009, French architect Jean Nouvel unveiled a mixed-use masterplan for the 11.5-hectare island and its surroundings that included his own design for an office block resembling three separate buildings stacked on top of each other. The masterplan has since undergone several revisions, as ownership has changed over the years. 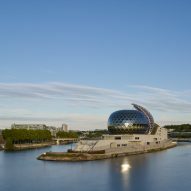 The opening of La Seine Musicale marks the first completed cultural venue on the island. The current proposal will also see a new arts centre designed by Catalan architecture studio RCR Arquitectes erected to house the collection of property developer Laurent Dumas, alongside a hotel by Baumschlager Eberle. La Seine Musicale occupies around a third of the island at its western tip. 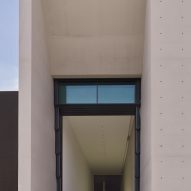 In keeping with Nouvel's original plan for Ile Seguin, a concrete wall wraps around the building's perimeter, evoking the industrial aesthetic of the former factory. 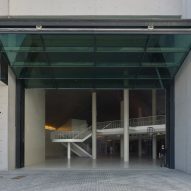 An enormous folding door allows visitors to enter a lobby and internal street lined with shops, a jazz club, and five studios and practice rooms, which can be viewed through windows. The large auditorium is topped with a landscaped green roof. This drops down to the level of a lower perimeter wall, which extends towards the end of the island and allows the rounded classical auditorium to emerge. Ban ranked at number 50 on the inaugural Dezeen Hot List. The architect received the prestigious Pritzker Prize in 2014 in recognition of his innovative work in the field of disaster relief, which has seen him design modular shelters for earthquake victims and create timber and earth houses for use in areas affected by tsunamis. He is also renowned for his creative approach to using materials such as cardboard tubes, which he employed in the construction of a temporary cathedral in Christchurch, New Zealand, after its former Anglican cathedral was destroyed by an earthquake.